Ridgeline Igloo Top. This go anywhere do almost anything jacket is ideal for the evening stalk, wearing all day on a hunt, popping down to the local for a cold one. Fits brilliantly and is so warm! Exactly what I was looking for and still looks smart enough for a shoot day. My first try at Ridgline gear and I must say il definitely be purchasing more from them!! Well recommend!! 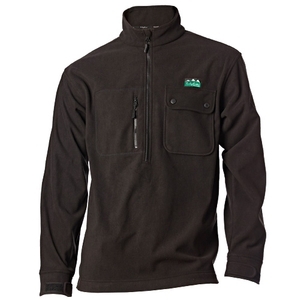 Nice windproof fleece warm and comfortable.Size is generous Im normally inbetween large/medium and would normally go large with outdoor gear like this. Although after reading reviews opted for medium and found it more like a large plenty of room for tshirtshirt and another lighter fleece underneath.Large size would have been massive so go smaller. Looking forward to winter and keeping warm whilst shooting clays looking down at Leeds / Bradford airport. Its a bit cold up there!! Excellent piece of kit but be wary of the posted Ridgeline sizing guide.According to the guide with a 45 chest I required an XL when I tried it on I was swamped. The sizing is very generous perhaps overly so for accurate online purchasing.A large was ordered as a replacement and it is a good loose fit big enough for an extra layer underneath when necessary but not excessively loose when worn with a base layer.It is a well made piece of clothing. The initial stiffness of the fabric quickly softens with wear and the top will swiftly become your goto choice. Great kit for my outdoor activities. Not new to Ridgeline. I have had some Ridgeline clothing from a NZ trip at the beginning of this century which is still going strong. This proper purpose made outdoor clothing that will last you a long to time. Top class quality!! My husband was very happy with this gift! Cant fault it and would diffinetely buy again!Fits true to size and washes well too. This fleece top is just super ! Its very warm as its wind proof and has great pockets just wear you need them ? Its my go to fleece if the weather permits me too? You will definitely not be cold in this ? Love it well recommended. This fleece is magic its super warm and thick, and its definitely windproof too? And the pockets are big enough for most phones, just love ridge line clothing as your always warm and dry in any of there clothing styles. Well recommended..
Been looking for a replacement top for hunting in the winter saw this ordered a Large bang on size wise im 5.10 43-44 chest and still room for a base layer underneath .I have paid twice this much for other fleeces and they dont come no way near as warm and well made as this .You will not be dissapointed this is a quality top .